I like the asymmetry of this design combined with the simplicity of the colors. I was very kindly invited by my friend and fellow blogger, Claire at KnitnKwilt, to participate in a blog hop. Claire has a great blog covering a variety of topics all of which are interesting to me – quilting, design, books, and Portland. All good things so please check out her blog! 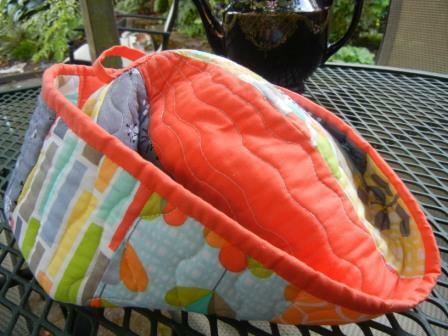 In turn, I’ve invited Debbie Scroggy, local long-arm genious to share her blog, AllQuiltedLLC. Debbie is an amazing designer and has won awards for her long-arm quilting right out of the gate. 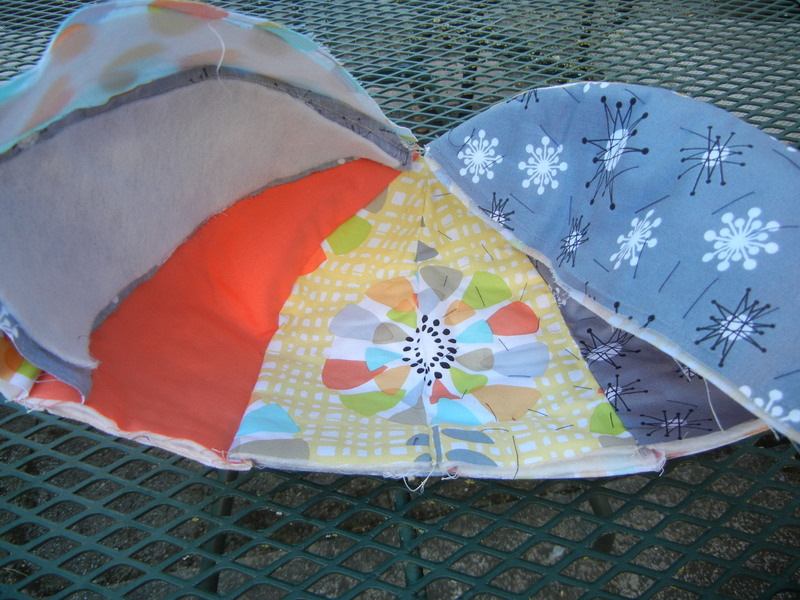 She also did the quilting of my quilt, Zen Umbrellas. This is my first blog hop but apparently the key is a series of questions that everyone answers. You can read back through the blogs and see a wealth of responses on how we feel about our art. The following are my responses to the questions. What am I working on? 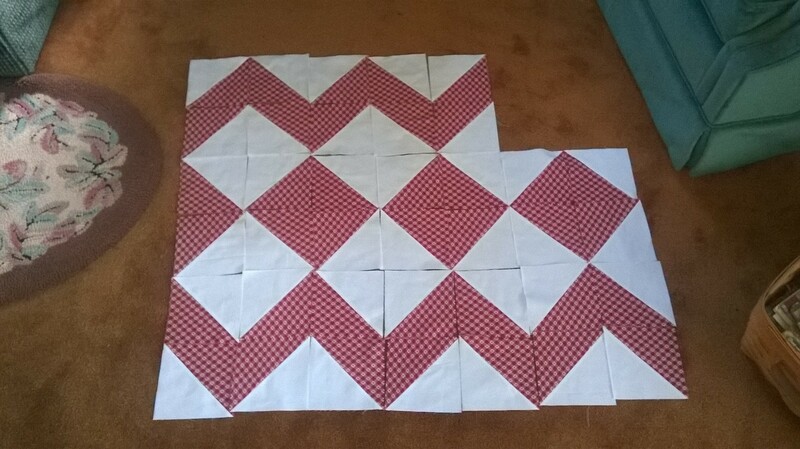 Right now I’m working on a red & white baby quilt for my niece Taylor who is expecting in January 2015. 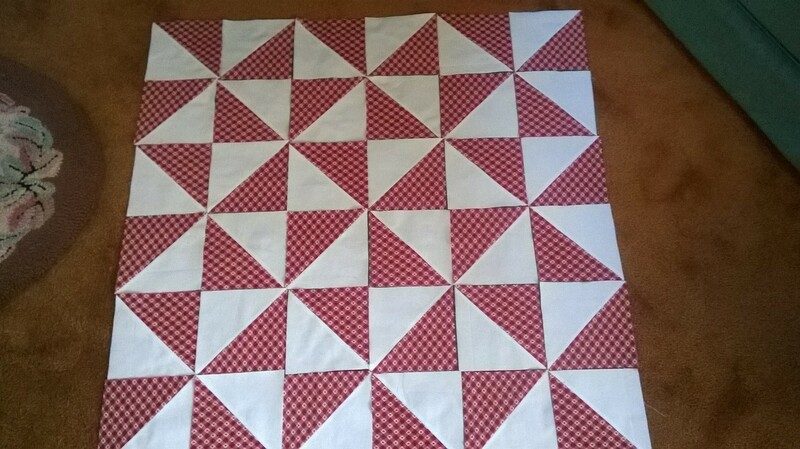 I’ve wanted to design a quilt using half square triangles to make asymmetrical chevrons, and I’ve wanted to make a red & white quilt, so the two got merged in a baby quilt. Here is a photo of the layout I chose – along with some that I considered. Pinwheels, or stars depending on your perspective. This one was definitely too ‘busy’ for me. I’m also working on the Aviatrix Medallion quilt-a-long from Elizabeth Hartman. I’m on the final border, but I want to expand it to queen size so I’ll be working on it a while longer. 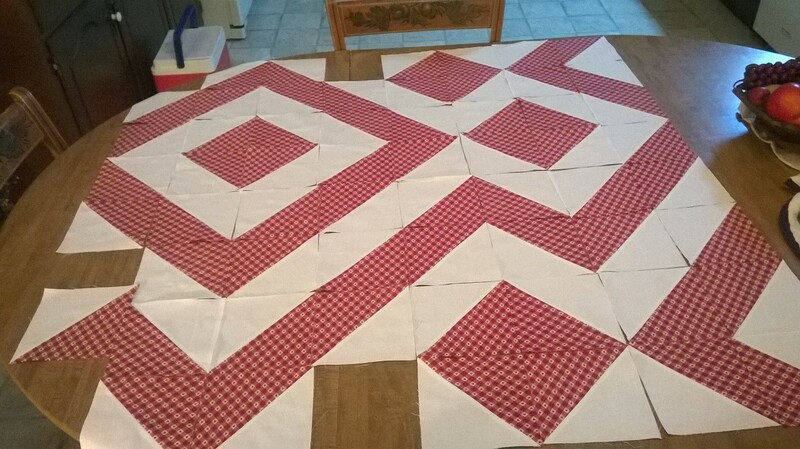 Here is the last photo I took of that quilt showing border 5 (the next to last border) laid out. Poor quality Instagram photo,#aviatrixmedallion, but you get the idea. 2. How does my work differ from others of its genre? I don’t know that it does differ. What I do know is that I’ve got a lot to learn about color. I struggle with getting enough variation in my fabric selections. I take chances on color combinations that I later regret. But I like taking chances and failing more than going a safe route that doesn’t break any new ground for me. 3. Why do I create what I do? I’ve been quilting for over 25 years, but only sporadically. A few years ago, I knew I needed more creativity in my life and it didn’t take long to decide on quilting as my medium. Since then I’ve been working very hard at quilting. I now have what my husband calls my ‘woman cave’ and others might call a ‘sewing studio’. I spend a lot of time in there. The challenge is going to be fitting my husband into my quilting life! I also feel this sense of urgency to make quilts for each of my children and for my nieces and nephews. So much to do! 4. How does my creative process work? Hmmm. Mostly I look at photos of quilts and see things that I admire. I borrow magazines from the quilt guild and books from the library. This all gels in my brain till something bubbles to the surface that I just have to try. 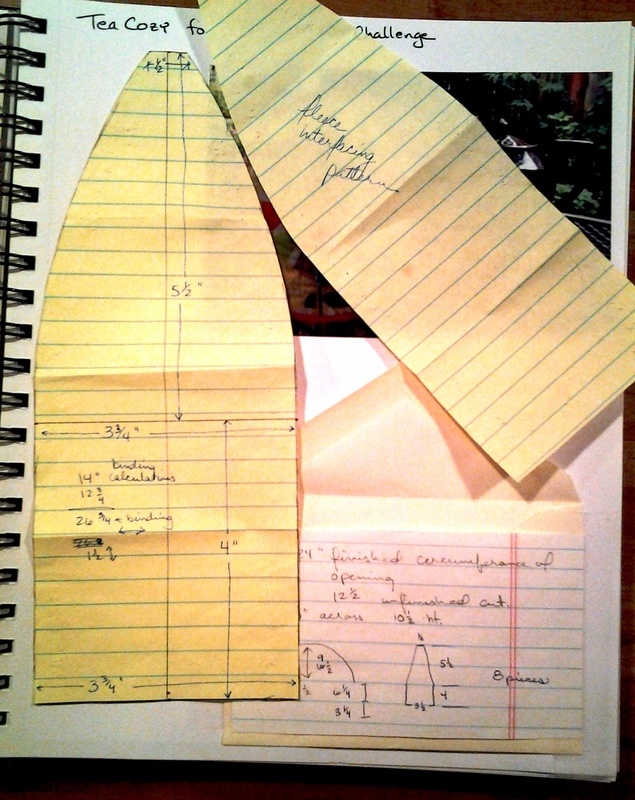 I haven’t historically followed a particular designer or pattern – I prefer to design something that I can call my own. The current Aviatrix Medallion quilt is an exception. Folks following the quilt-a-long can post their work on Instagram, and it’s been fun to see the effect of the various color selections. 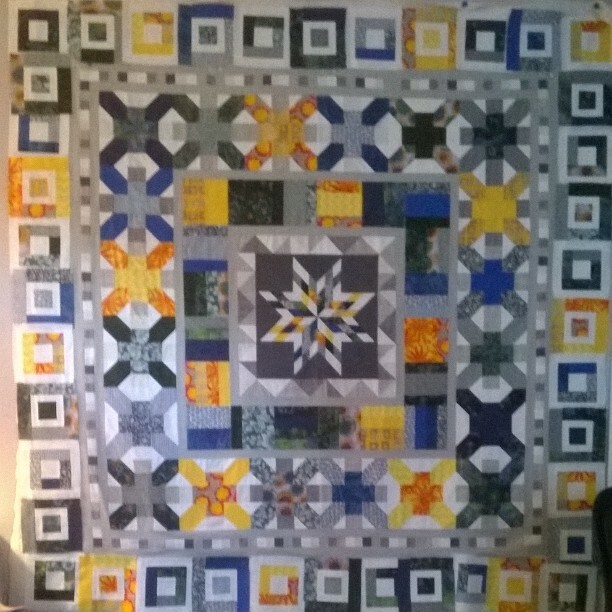 Here is an example of my creative technique: In June 2012, I had started to reconnect to quilting, and I had pieced a mostly traditional quilt for my son. I was seeing quilt patterns everywhere. 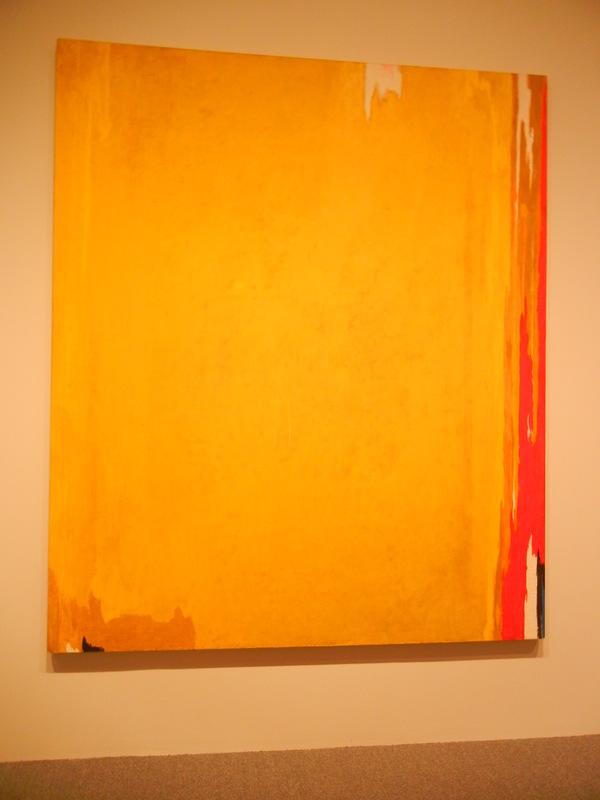 My youngest daughter and I were in DC being tourists, and we went to the Hirschhorn, the Corcoran, and the Smithsonian Museum of Modern Art among many other wonderful places. I took lots of photos of things I found inspiring. The following painting in particular has stayed in my mind, and recently I knew that it would develop into a quilt in the very near future. I’ll have to look up the artist. Does anyone know who painted it? I remember this painting to be a little different than this photo, so maybe my brain had already started to redesign it into a quilt! But isn’t it cool! Thanks for reading my words, looking at my photos, and please visit Claire and Debby! I improved the color and contrast on one of the photos I entered in a recent quilt contest. 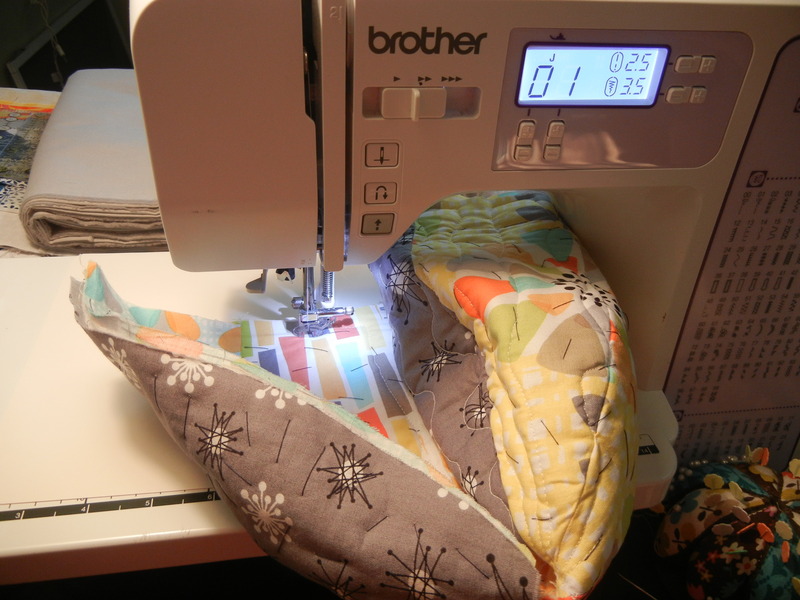 Do other quilters do the same? My quilt photos had been looking washed out – dull colors, flat light, boring. I’m not a trained photo editor, but even I can see some intriguing options in Microsoft Office Picture Manager – color, brightness and contrast, auto correct! I increased the contrast, and slid one of the icons from side to side until my color looked more true to life. But was I cheating? I read a later post by another contestant lamenting that her photos didn’t look as good as the real project. I thought about giving her a tip about using Picture Manager, but I’m trying to stop myself from telling others what to do. Here are two photos. One has been touched up, the other hasn’t. It makes a big difference! This photo has been enhanced, probably too much since the orange isn’t really that bright. This is the original photo. Obviously not very good. What do you think? What do you do? Do those who have access to technology have an unfair advantage? 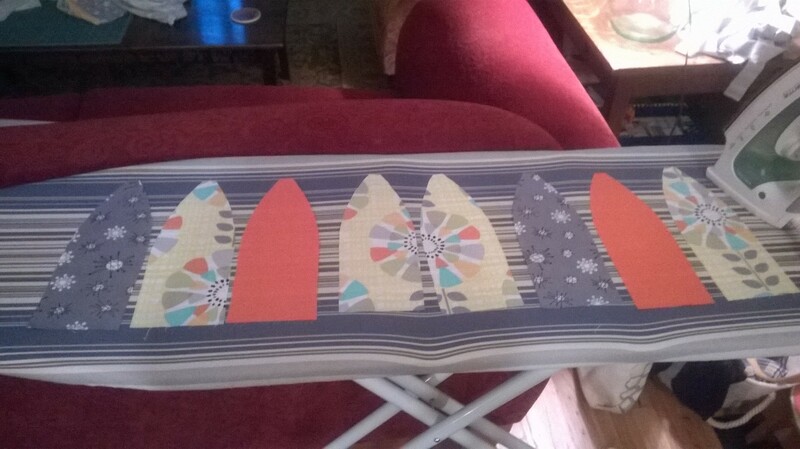 Is photo editing the steroid of the quilting industry? Am I making a mountain out of a mole-hill? 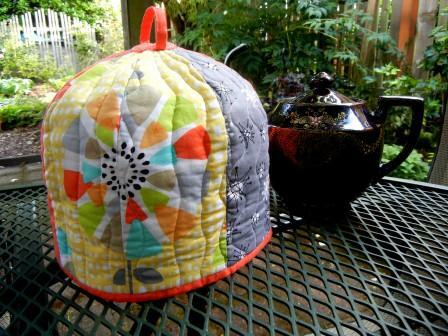 For a recent Michael Miller challenge, I made a tea cozy. I figured this would be cool as who else would make a tea cozy! (Someone did. And hers might, just might, have been nicer than mine.) But I digress. This is a little post to show you how I made my tea cozy. I measured my tea pot. I did some calculations. I thought long and hard about how to create the dome shape I was looking for. I think my first thought would have sewn up as a cone. Here is a photo of my pattern. I cut 8 petals of fabric for the outside and 8 petals for the lining. The cozy ends up being reversible. Here is the layout I used for the outside. I cut 16 smaller petals out of a thermal lining material found with the interfacing at a fabric store. I didn’t buy the one with the metal insulating layer because I was worried about how it would quilt. I spray basted (505 spray) a lining petal to the wrong side of each petal, both the inside set and the outside set. Then I sewed the set of 8 inner petals together along the long seam. I left the final seam open. Separately, I sewed the set of 8 outer petals together along the long seam. This is about the time it became clear to me that I’d created a really difficult way to make a tea cozy. I nested the inner layer against the outer layer, mostly matching up an inner petal against an outer petal, and I hand basted densely. It looked like the photo below when I was about half way through basting. At this point, the inner petals are nested against the outer petals and some petals have been basted. 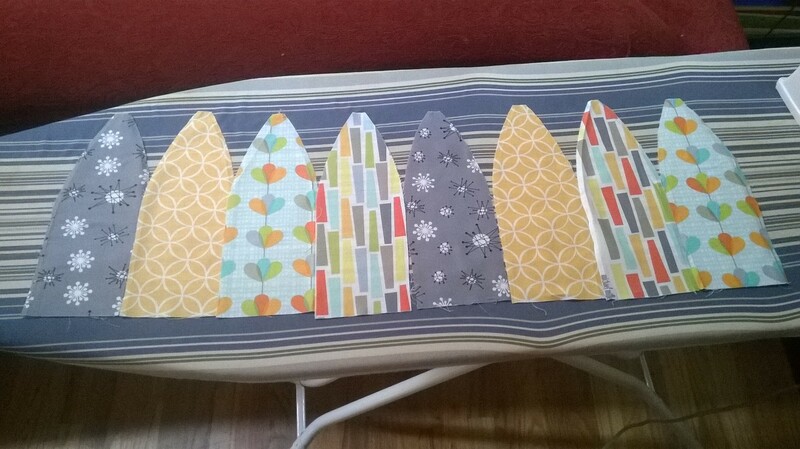 I left the one side open so that I could machine quilt the two layers together. That looked like the following photo. The machine quilting went fairly well despite the petals wanting to curl in. I didn’t quilt right up to the unfinished edge as I would need to fold this edge under before sewing the final seam. I particularly like this view. Two petals were placed next to one another on the fabric and then cut out. They were able to maintain the integrity of the flower pattern in the fabric. If you actually try to make this (and please let me know if you do because I want to meet someone as crazy as me!) you’ll find that there is a round hole at the top about the size of a nickel. I made two small loops, hand tacked them down to the edges of the hole, then hand appliqued a small circle over the top to hide the edges of the loop. One tip is to sew both the inside and the outside loops to the cozy before you do either the inside or the outside appliqued circle. I had to do some un-sewing because of that little mistake. Of course you can see that there is binding around the bottom edge. No special trick needed for that. One of the great things about this design is that it is fully reversible. There are no rough edges anywhere and all of the polyester-type insulation is fully covered by cotton fabric. There was something about having uncovered poly next to my steaming tea that bothered me. I’m very content with my new tea cozy. 🙂 Here is a final photo showing the fully reversible nature of the cozy. FINAL NOTE: Due to the dome style of this cozy, my children, the youngest of whom is 17, have taken to wearing the tea cozy around the house as a hat.